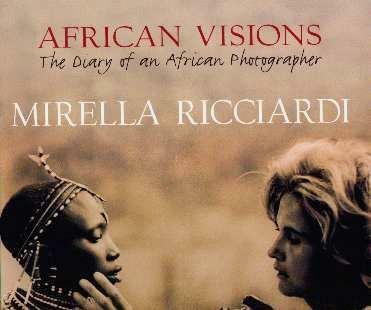 What an extraordinary story Mirella Ricciardi has to tell, both her own personal French "aristocratic" background (well to do French artist mother and penniless Italian pilot and exiled father) and her deep-rooted connection to Africa. She was born in Kenya and lived in her parents' "Mediterranean pink Italian-style palazzo" they built in Naivasha. She weaves an extraordinarily fascinating web of a story of her childhood, and how she became interested in photography. At age 36 she returned to Africa on assignment and her famous book Vanishing Africa, was born. Its success was her freedom to be the person she wanted to be - an independent woman. With a publishing contract in hand, she left Europe and returned to her place of birth and began a journey criss-crossing Africa to take photographs (she covered 20,000 miles) in extremely remote places. Later, she and her husband crossed the continent by boat from the Indian Ocean to the Atlantic Ocean in 18 months. Ms. Ricciardi certainly has lived an adventurous and somewhat exotic life - not everyone has this kind of courage. She raised her two daughters in Kenya and her intimate account of the continent and its people, the wars and starvation, and her own final departure, make for incredibly interesting reading. She tells of the people she met and about life in Kenya - the good and the bad. Africa is in your blood and your soul as I too, was born in Africa. Visit Mirella at her website for more information. Conclusion - A wonderfully interesting and captivating book.